A recipe for a fresh and vegan bread spread, quickly to make and the ingredients are easily available in super markets and organic grocery stores. The bread spread is suitable for Vegetarians and Vegans, as well as for those with allergies and sensibilities against wheat and egg. This yummy spread will be liked by meta lovers as well. 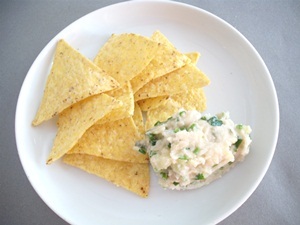 You can eat the spread on bread, use it as a dip for veggy sticks or serve it to grilled food and barbecue. 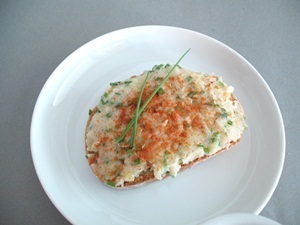 Our vegan vegetable spread is based on white beans, zucchin and fresh chives. Use a fork to mash the beans, add lime juice and season with cumin and salt. While the beans and the flavours mix up well, cut the zucchinis in small cubes (brunoise - as a chef would call it). Nutritious vegetable bread spread - easy to make, could be used as cold vegetable sauce and dip. Heat the oil in a pan and fry zucchini cubes. Let zucchini cubes cool down and cut the chives. Add up the zucchini to the bean paste mix and add chives. 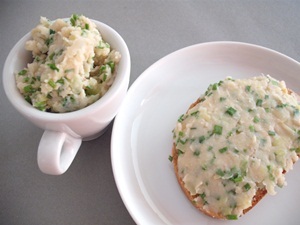 This vegetable spread can be left up to one day in the fridge (chives is best eaten fresh). The volume of the recipe is about the size of regular cream cheese. Enjoy your bean spread with bread, serve it as an appetizer with carrot and cucumber sticks, eat it as sauce when having BBQ or together with tortilla chips. If your are not used to eating legumes like beans and lentils, then have only a small amount of them. 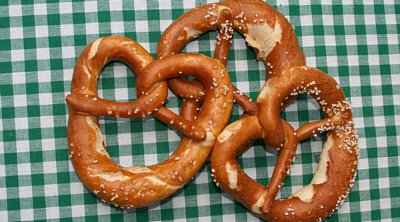 The nutritious, healthy beans are easier to digest if you eat them regularly. It is similar to mountain walking, where it gets easier the more often you do it, your digestive system needs some practice to digest this vegetable source of proteins.